Interstate 575 & Georgia 5 lower to cross Sharp Mountain Creek ahead of Ball Ground beyond Airport Drive (Exit 24). Photo taken 08/22/03. Interstate 575 is both a commuter freeway and part of a long distance route between the north Atlanta suburbs and the North Georgia Mountains. Cosigned with State Route 5, and internally designated as State Route 417 by GDOT, the freeway spurs 30.97 miles north from densely developed areas of Marietta and Kennesaw in Cobb County to rural areas in northern Cherokee County. The north end of I-575 near Nelson transitions to SR 515, Appalachian Development Highway (Corridor A). SR 515 overlays SR 5 northward to Jasper and Ellijay, and U.S. 76 from Ellijay east to Blairsville and the North Carolina state line near Hiawassee. 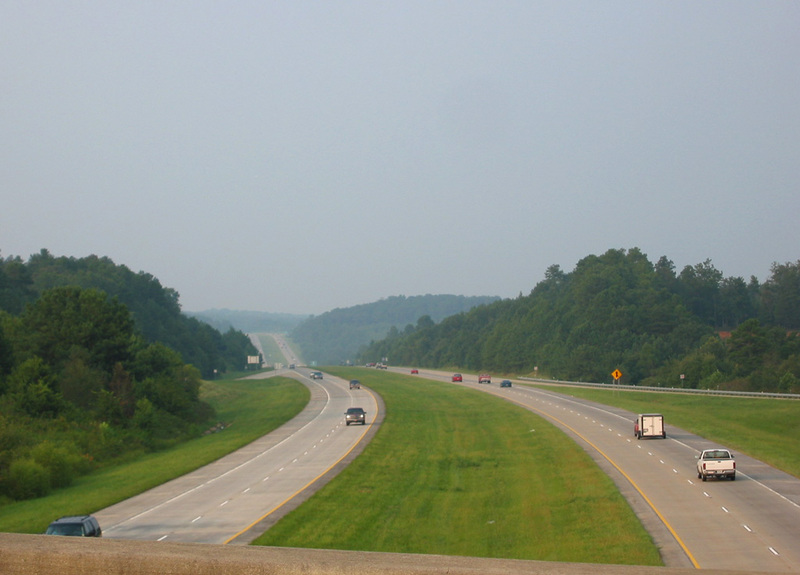 The majority of the 76 mile route consists of controlled access expressway. Long since replaced, this button copy trailblazer for I-75 directed motorists departing I-575 north at Exit 1 onto Barrett Parkway west. Photo taken 12/07/99. Approaching Interstate 575 & Georgia 5 along Barrett Parkway westbound. This assembly was replaced by 2008 with a signal ahead regulatory sign and lone I-575 shield. Photo taken 12/07/99. Sixes Road north at Interstate 575 & Georgia 5 (Exit 11) back when it was still just two lanes wide and before development took place to the northeast. Photo taken 05/29/07. This shield assembly was posted along Airport Drive south at the diamond interchange (Exit 24) with I-575 & Georgia 5. Photo taken 08/22/03. A narrow width shield once posted along Airport Drive south at the northbound on-ramp for I-575 to Ball Ground and the APD Highway to Ellijay. Photo taken 08/22/03. "Paving the way New Ridgewalk Interchange: &apos;A long time coming&apos;." Cherokee Tribune (Canton, GA), November 30, 2012. 08/22/03 by AARoads and Justin Cozart.